Dragon Age: Inquisition offers a wealth of hidden secrets and Easter Eggs, so I've assembled a list of some of my favorites, in case they're helpful. Solas's ancient and beautiful fresco paintings, which fill the walls of his round tower room as the story progresses, actually tell the story of the Inquisitor, and each panel reflects a major choice or decision the Inquisitor made so far. Solas's paintings will also actually change subtly from playthrough to playthrough, depending on decisions you make. I've posted a complete analysis on each in the links here. Solas also leaves a final fresco (unfinished) at the end of DAI. First off—why is it unfinished? My own theory is that it is unfinished for several deliberate reasons. and she'll agree to date you at the end of the game. As you discover the mosaic pieces all over Thedas, each time you return to Skyhold, they will be assembled and on the walls around Gatsi, the dwarf helping you research them. As you discover Bottles of Thedas and Warden Ale through the game, you can actually find all of the bottles you've acquired on shelves in the Skyhold wine cellar! Most of the agents you recruit can be found and talked to at Skyhold soon after they're recruited. Whoever you saved in the attack on Haven will also be hanging out at Skyhold—most typically, around the grounds out front, or also in the courtyard gardens. Josie's 15% "Elite Clientele" Perk discount upgrade adds an actual treasure vault to Skyhold. 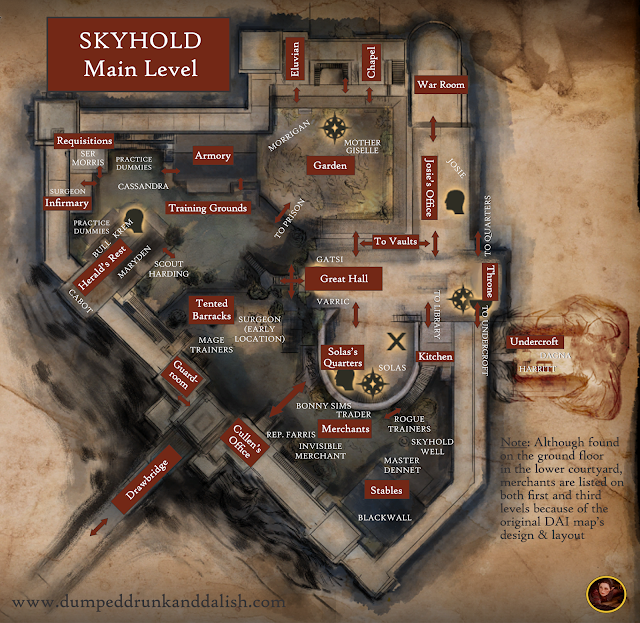 If you choose imprisonment for any wrongdoers who come before you in judgment, you can find them later in the Skyhold prisons. You can also sometimes talk to them (but there's also a known bug that makes that difficult). After "Wicked Eyes and Wicked Hearts," if you conscript Florianne as a Court Jester at Skyhold, she'll show up in the background in the throne room on occasion. If you finish The Last Court via the Dragon Age Keep, you'll get two additional War Table Missions (and some cool new Skyhold customization options). When you break down doors in various locations, be sure to loot the rubble -- the "Sad Splinters" you collect from them can eventually be used to make a very silly weapon. You can find a bottle of Warden Ale owned by either Carver or Bethany Hawke from Dragon Age II (if either of them joined the Wardens during your DA2 playthrough). You can also find Anders's manifesto in the locked Apostate's Shack on the Storm Coast! If you decorate the Throne Room with Orlesian decor, Vivienne will comment favorably on it. Meanwhile, if your approval rating from Vivienne is low enough, she'll also actually rearrange your furnishings as subtle revenge. eventually accompany you in combat "Before the Dawn!" eventually accompany you in combat in the quest "Before the Dawn!" 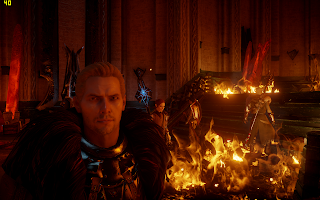 If you don't get all the notes, or move on to "What Pride Had Wrought," the quest will simply complete passively without Cullen going with you (which was how it went for me in five different previous playthroughs! ), so it's really fun to pay attention to the details, complete this quest, and to get the chance to see Cullen in action (he's wonderful to watch using his Templar skills in combat). You'll also get additional dialogue here if you're romancing Cully Wully. Talk to the young man Sutherland upstairs in the Herald's Rest tavern. He wants to help, triggering a series of terrific War Table missions and very sweet (and occasionally funny) follow-up scenes. You can actually romance Scout Harding (or at least "soft romance" her). Just don't flirt or get involved with anyone else, flirt with her at every opportunity, and eventually she will talk to you about your feelings and arrange a date. 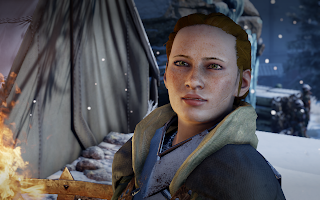 Meanwhile, if you're a female Inquisitor and Sera is in your party, Sera will slightly approve each time you flirt with Scout Harding. If Morrigan was romanced or did the Dark Ritual in your DAO playthrough (or Dragon Age Keep worldstate) with a male Grey Warden (who was not the Hero of Ferelden), do the quest "Wicked Eyes and Wicked Hearts" before the Grey Warden showdown "Here Lies the Abyss" for extra dialogue in the garden between Morrigan and the child's father. For more DAI secrets, check out my follow-up post (Part 2) here!